On this page, you can find all models of footstools by VAMA Divani, some very attractive furniture pieces both to enrich the style of the room in which they are placed and to make, for example, a sofa more convenient and comfortable. If you do not find the right model that meets your needs, ask for a free quote to realise your own footstool following a drawing or a custom model. The footstool, in fact, can be used as a chaise longue element to be combined with a sofa of any type, as a small table and, of course, as a storage box: some models which you can view in this section, in fact, are equipped with a comfortable inner container in which it is possible to store several objects. 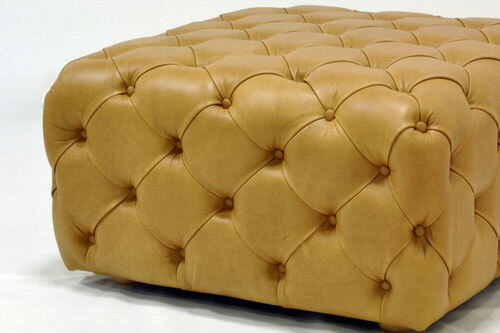 In terms of design, you can choose among numerous models: they range, in fact, from simpler and linear footstools, perfect to be combined with modern sofas, to the more refined and detailed ones, such as the beautiful leather footstools embellished with buttoned details, a typical decoration of the Chesterfied sofa. The footstool is really much more than just a detail. On the contrary, it is a furnishing element that can add style and personality to the context in which it is placed, and the presence of an inner storage box can ensure a great space saving. 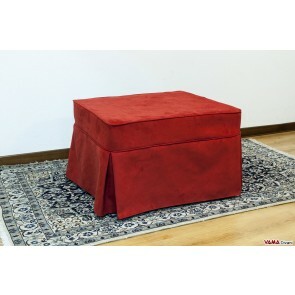 Round, rectangular, crescent footstools... also concerning their shapes, these furniture elements can be chosen in many different models, and their design is impeccable: when their lid is closed, in fact, it is almost impossible guessing that the footstools feature a useful storage compartment. Masterpiece of elegance and style, the Da Vinci buttoned footstool features the same buttoned details that embellish the Chesterfield sofas, realised with diamond patterns. Designed to be coupled with these timeless classic sofas, Da Vinci proves to be impressive even in modern spaces. Like all the footstools of our collection, you can customise its colours and its upholsteries. 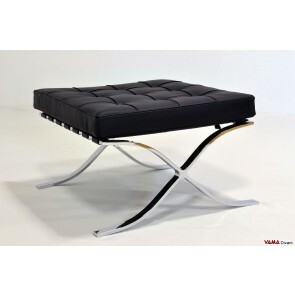 Footstool in finely worked leather with a striking steel structure. The Barcellona footstool features the same technical and aesthetic characteristics of the armchair with the same name, and thanks to its elegance, it can be suitable for many different combinations, as it can be customised in any colour and leather upholstery. The footstool bed is a truly unique creation, a stylish and compact footstool which, thanks to an internal impeccably designed structure, can be transformed into a comfortable single bed with a 12 cm thick comfortable mattress. 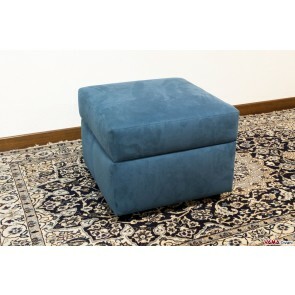 Very stylish and perfect thanks to its upholstery, in fabric or leather, designed to wrap it in its footstool version, this footstool turns into a comfortable bed in a very easy way. A masterpiece of furniture, this footstool bed is ideal for those who want an additional bed always available, without any clutter. Storage footstool characterised by a sleek and modern design, with perfectly smooth surfaces and angular shapes. The model shown in the picture is entirely upholstered in microfibre, but you can choose the kind of upholstery and the colour you want. The Marco footstool allows you to place many different objects in its inner box, moreover, it can be combined in many different ways.